I've said previously that I like to use something in real life as a jumping off point for my maps. 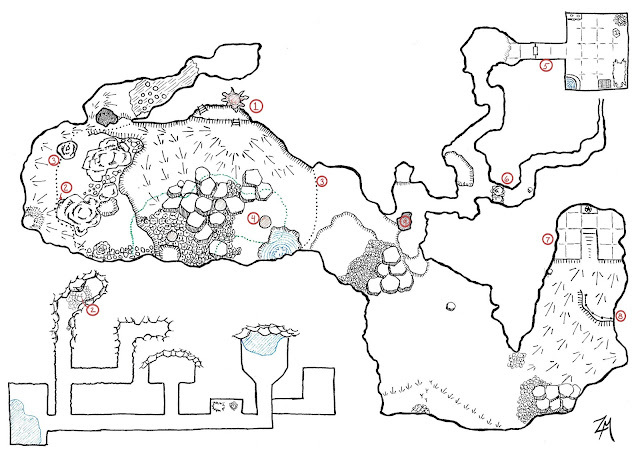 The Cave of the Kobolds was inspired by a cave in West Virginia I've visited on several occasions. 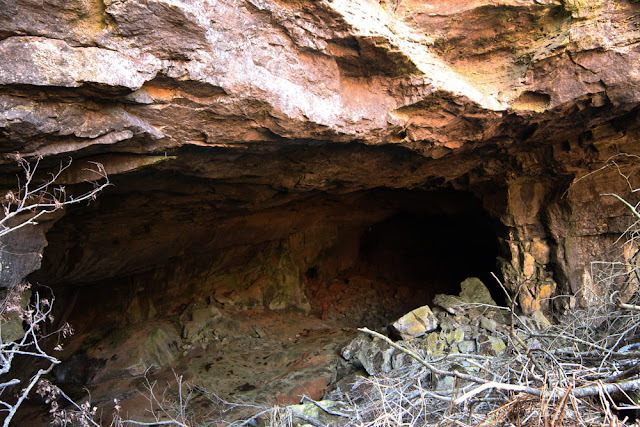 The characteristic qualities of this cave are that its in an immense sinkhole, with an impressively large entrance and large passage that terminates abruptly. The cave was once a single large passage near the surface until, for one reason or another, the roof collapsed over the center. Now, the only way in or out is to climb down a ladder into the sinkhole. This, I thought, would be a perfect place for a kobold settlement. Specifically a religious one that guarded some sort of sacred relic. I had imagined this as a special place kobolds pilgrimage to. Player's map version of the Cave of the Kobolds. The only way in and out is through the ladders down in the center. 1. Entrance - The easiest way into the sinkhole is by climbing down these two ladders, each of which are 20' high. This brings you to the top of the scree pole which descends another 30' to the sinkhole floor. The scree pile is unstable and slippery. The remainder of the sinkhole has 60' - 80' cliffs leading up to the relatively flat fields surrounding the cave. 2. Entrance to the kobold barracks - Underneath the large stalagmite and breakdown pile is a small opening which a small or smaller creature can easily crawl into. (the crawl is tight for medium creatures and impassible for large or larger creatures). 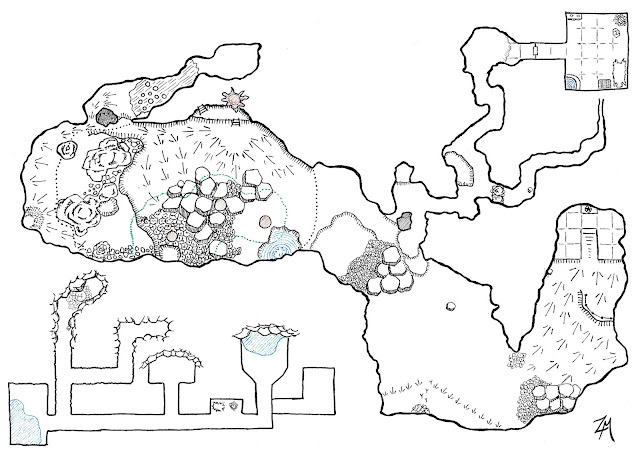 This little hole leads to the lower level where the majority of the kobold tribe which support the temple lives. The tribe lives in somewhat crowded conditions (which I have left to the imagination). Kobolds make their way up and down this entrance by scaling the walls. Scaling the walls is a moderately difficult accomplishment, made easier if you are medium sized or larger. 3. Drip line - The dotted lines represent the continuation of the cliff face over the cave passages (what in caver parlance is called a 'drip line'. 4. Trees - The middle bottom of the sinkhole has been open to sunlight for so long that large trees have grown nearly up to the lip of the sinkhole (80' here). The dotted green line represents the edge of cover from the trees. This is also a good place to put a fun little animal encounter. 5. Old Dwarven Room - Long before the kobolds came, the dwarves carved this room out of the rock at the end of the passage. After they left, the kobolds came and reappropriated this room for their high priest / leader. The medium-sized door is locked and quite sturdy. 6. Abandoned passage - this passage doesn't go anywhere, but its a good place for kobold guards to set up an ambush for the PCs. The end of the passage is where the two lines parallel each other quite closely. the passage doesn't end, but you'd have to be gaseous to continue. The continuance of this passage would go past and under the dwarven room (Area 5). 7. The great altar - here is where the kobolds pilgrimage to. There is a long, muddy slope which must be traversed to reach the sacred relic and it is difficult going. The acolytes who care for the relic know the places to step and not to step, so for them it is not difficult terrain. For all others, it is quite the challenge. 8. Acolyte resting place / defensive strong point - Acolytes who are on duty sometimes rest against this low retaining wall. It also serves as excellent cover against intruders trying to scale the muddy slope. Acolyte kobolds fight to the death and are inspired by the presence of their relic. 9. Stone pillar - This is just a stone pillar. Oh, and here's a photo of the entrance to the cave. Note the size of the person in the center.